Hepatic encephalopathy (HE) is a disturbance of the central nervous system (CNS) function secondary to porto-systemic shunting. It usually occurs in the setting of advanced liver cirrhosis or acute fulminant hepatic failure. An extensive Medline search was undertaken and all relevant papers found were critically examined. Special emphasis was paid to clinical trials and meta-analyses. All guidelines and conference proceedings related to hepatic encephalopathy were also examined. HE presents with a spectrum of neuropsychiatric manifestations that may be quite subtle (minimal HE) or overt, ranging from disturbance of the sleep pattern to deep hepatic coma. Most patients with HE may be diagnosed on clinical grounds only after excluding other causes of neurological disease, but a wide variety of neuropsychological, neurophysiological, and neuroradiological tests may be utilized. The first step in the management of patients with HE should be supportive care. Following that, a significant effort must be exerted to find and correct possible exacerbating factors which may include: renal impairment, infection, constipation, drugs, gastrointestinal bleeding and other factors. Medications used to treat patients with encephalopathy aim to reduce toxin production, increase toxin elimination, and protect the brain from the harmful effects of these toxins. A critical analysis of the evidence concerning most of the available management modalities is presented. Ultimately, all patients with HE must be considered for liver transplantation. It is concluded that early recognition, positive diagnosis, and a multi-target management plan constitutes appropriate management of patients with HE. Background: The role of Helicobacter pylori (H. pylori) eradication in non-steroidal anti inflammatory drug (NSAID) users with peptic ulcer disease is controversial especially in countries with a high prevalence of the infection. Furthermore the value of low dose omeprazole for maintenance of remission is not yet known. Patients and methods: 138 symptomatic out-patients receiving continuous COX 1 NSAID therapy, were treated with omeprazole 40mg/day upon endoscopic confirmation of gastro-duodenal ulceration or erosions while those infected with H. pylori received in addition clarithromycin 500 mg and amoxycillin 1000 mg twice daily during the first week of treatment. After endoscopic confirmation of healing at the end of week 5, the patients were randomized to receive omeprazole 10 mg (n=50) or 20 mg once daily (n=66) and endoscopy repeated after 20 weeks. Results: The overall healing rate (per protocol) at five weeks (116/128) was 90.6% while in 85.5% (65/76) eradication was successful. The healing rate for the H. pylori eradicated patients (58/65) was 89.2%. For those who failed eradication (8/11) it was 72.7% (NS), while for patients not infected with H. pylori at entry to the study (50/52) it was 96.2% (NS). An intention to treat analysis showed that after 20 weeks of omeprazole prophylaxis with the 10mg dose 86% (43/50) had maintained healing while for the 20mg dose a similar figure was observed (87.9; 58/66). Only three patients in the two groups (pp) had persistent H. pylori infection, all of whom relapsed. No patients discontinued treatment because of adverse effects of the drugs. 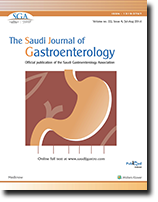 Conclusion: H. pylori eradication was not associated with impaired ulcer healing in a Middle Eastern population with symptomatic NSAID induced gastro/duodenal lesions, when a high healing dose of omeprazole (40 mg) was used. After eradication, omeprazole 10 or 20 mg per day were highly and equally effective for maintenance of gastroduodenal mucosal integrity during continued NSAID use. H. pylori should be eradicated from symptomatic Middle Eastern NSAID users with peptic ulcer disease. Background : Helicobacter pylori (H. pylori) is an important pathogen in gastrointestinal disorders. Seroprevalence among asymptomatic and chronically diseased children in Jeddah, Saudi Arabia was determined to gain insight into its prevalence. Methods : Serum samples obtained from 1432 children; 543 asymptomatic and 889 chronically diseased children (diabetes, chronic asthma, chronic hemolytic anemia, neurological impairment and Down's syndrome); were tested by ELIZA for H. pylori IgG antibodies. Demographic data obtained including nationality, gender, age and disease status. Results : One hundred and twenty eight (23.6%) of 543 asympatomatic children were seropositive with no significant difference in seroprevalence of infection between Saudi and non-Saudi (p<0.09) and between boys and girls (p<0.67), but significant rise was notice with increasing age (p<0.001). An increase in risk of H. pylori among chronically diseased children was observed (diabetes: 34.4%, chronic asthma 20.4%, chronic hemolytic anemia: 31.7%, neurological impairment: 32.1%, and Down's syndrome: 29.2%) which increased significantly in chronic anemia and neurological impairment (p<0.01 and p<0.05) compared to controls. The prevalence did not differ according to nationality and gender but significantly increased with age in chronic asthma, chronic anemia and neurological impairment (p<0.01 for all) and also increased significantly with duration of illness, number of blood transfusions, number of hospital admission and mode of feeding. Conclusion : Infection with H. pylori seems to occur early in life and its prevalence increased with age in Jeddah, Saudi Arabia. The risk of H. pylori infection was significantly increased within children suffering from chronic hemolytic anemia; neurological impairment compared to controls and was significantly related to severity of the chronic disease. Objectives: Diagnostic laparoscopy has become an integral part of general surgical procedures with the recent advancements in laparoscopic technology. Since surgeons are more oriented in viewing and dissection of different intra-abdominal areas and are proficient in the definitive management of complications in the procedures, diagnostic laparoscopy may be better off in the hands of surgeons. Laparoscopy has proved to be an important tool in final minimally invasive exploration for selected medical patients with chronic abdominal disorders, the diagnosis of which remains uncertain despite employing the requisite laboratory and non-invasive imaging investigations. This retrospective study was done to evaluate the accuracy of elective diagnostic laparoscopy in patients with chronic abdominal disorders and its impact on the management of these patients. Methods: The records of 35 patients, admitted to Riyadh Medical Complex with chronic abdominal disorders and referred to the author by physicians for elective diagnostic laparoscopy from 1999 through 2004, were evaluated for the accuracy and impact of this procedure in the further management of these patients. All 35 patients were investigated by the referring physician. Investigations included hematology, biochemistry, radiology, ascitic fluid analysis, endoscopic and imaging studies and the Mantoux test. These investigations suggested abdominal tuberculosis in 22 patients and intra-abdominal malignancy in 13 patients. They were referred for elective diagnostic laparoscopy and tissue biopsy. Results: Diagnostic laparoscopy confirmed the diagnosis in all patients suspected of malignancy. In patients with suspected abdominal tuberculosis, the laparoscopic diagnosis and biopsy revealed tuberculosis (16 patients), liver cirrhosis (2 patients), Crohn's disease (1 patient), and metastatic carcinoma of terminal ileum (1 patient). In 2 patients the procedure did not reveal any specific pathology. The accuracy of the preoperative investigations for those suspected to have abdominal tuberculosis was 71 %. There was 100% impact of diagnostic laparoscopy on the management of all 35 patients since, in the 2 patients with negative laparoscopy, at least tuberculosis and malignancy were excluded. Conclusion: Diagnostic laparoscopy in the hands of surgeons proved to have an impact as an investigation technique, where the diagnosis remained uncertain after the laboratory and non-invasive investigations, of selected medical patients with chronic abdominal disorders. It is a minimally invasive procedure which has a high percentage of accuracy in diagnosis and impact in the further management of selected patients. Background: Biopsy of the small bowel is frequently obtained by endoscopic forceps instead of the classical suction capsule, yet reports from developing countries are scarce. Aim of the study: to report our experience on the diagnostic value of this procedure in our community. Patients and methods: A retrospective analysis of all endoscopic duodenal biopsies (EDB), performed on all patients below 18 years of age. Data retrieved from the records included age, gender, nationality, indication for biopsy, the endoscopic findings, and the results of histopathology. Results: From 1993 to 2002, 241 endoscopic biopsies were performed on 241 consecutive children. Most of the children (96%) were Saudi nationals, the age range between six weeks to 18 years, and male to female ratio was 0.7: 1. All of the biopsy material was adequate for routine histopathology. The commonest indications for biopsy were short stature and chronic diarrhea in 116/241 (48%) and 102/241 (43%) of the children respectively. Refractory rickets accounted for 11/241 (5%) of the indications. The prevalence of villous atrophy was highest in children presenting with chronic diarrhea (40%), compared to short stature (22%). Other less common, but important findings were villous atrophy in three unusual conditions (one refractory rickets, one unexplained anemia, and one polyendocrinopathy), two cases of intestinal Giardia lamblia infestation, three cases of intestinal lymphangiectasis and one case of Mycobacterium avium intracellulare. Unexpected endoscopic findings were documented in 34/241 (14%) of the children. Conclusions: Endoscopic duodenal biopsy is adequate not only for the diagnosis of villous atrophy, but also for the detection of other gastroenteropathies. Accordingly, when expertise and equipments are available, EDB should be the procedure of choice not only in industrialized but also in developing countries. We report a series of three mentally-retarded patients who presented with dysphagia, cough and recurrent pulmonary infection, adrenal insufficiency and alacrimia. Investigations included ultrasonography and CT scan of the abdomen, in addition to barium swallow, esophageal manometry and esophagoscopy confirming the diagnosis of achalasia. Glucocorticoid therapy was prescribed whereas alacrimia was managed by lubricants. In two of our patients dysphagia responded to dilatation while the third required cardiomyotomy. Non alcoholic steatohepatitis (NASH) has gained a lot of attention recently due to the increased prevalence of diabetes, obesity, and hyperlipedemia. The endogenous compounds, endocannabinoids (ECBs), bind to the same receptors as tetrahydrocannabinol, the active component in marijuana and hashish. Recently, two G-proteins coupled, and specific receptors, to cannabinoids, CB1 & CB2, which act via adenylate cyclase and calcium channels, were described. In this brief review, we shed light on the possible relation between NASH and these proteins. 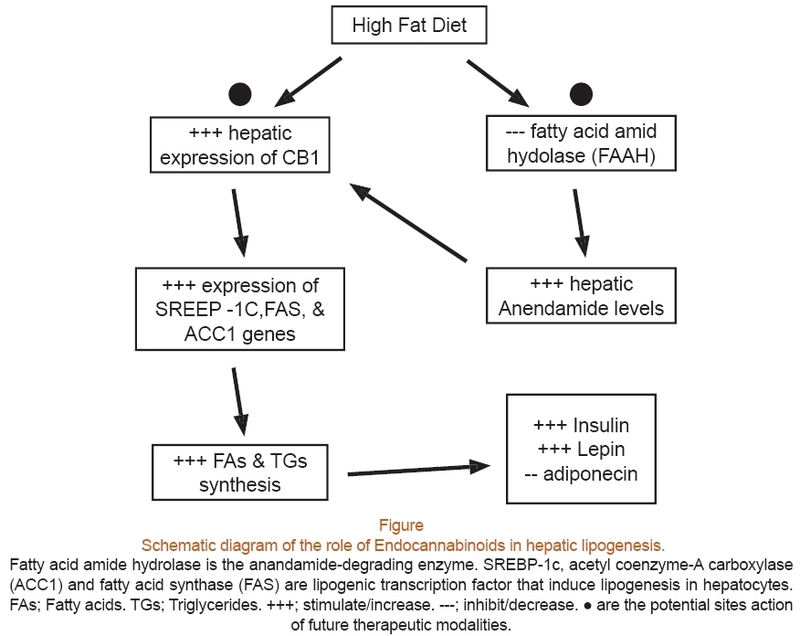 It has been hypothesized that ECBs regulate peripheral lipogenesis. Some studies suggest that in CB1-deficient mice there is complete resistance to the development of dietinduced hepatic steatosis, while wild-type mice showed remarkable hepatic steatosis after 3 and 14 weeks of high-fat diet. Based on these results and others, the hepatic ECB system may be a target for the treatment of NASH. The CB1 antagonist, Rimonabant, will shortly be approved for the treatment of obesity and may thus reduce the necessity for bariatric surgery. Autoimmune hepatitis (AIH) is a chronic inflammatory disease of the liver of unknown cause. Typically, immune suppressive therapy is used initially for treatment, either in the form of steroids or Azathioprime. In a small proportion of patients, steroids resistance or steroid intolerance develops. When patients are unresponsive to steroids, or develop severe significant side effects to their use, alternative treatments must be used. Mycophenolate mofetil (Cellcept) is a potent immune suppressive medication that is used in a wide variety of autoimmune diseases as well as post solid organ transplantation. Data is emerging to suggest that this medication may be used in selected patients with steroid resistance or steroid intolerance. This data is summarized in this review.